This time of the year is usually dedicated to retrospection. Typically, you are looking at the past twelve months, at your achievements in that period, your mistakes and disappointments, and make pious pledges to become a better person the following year. 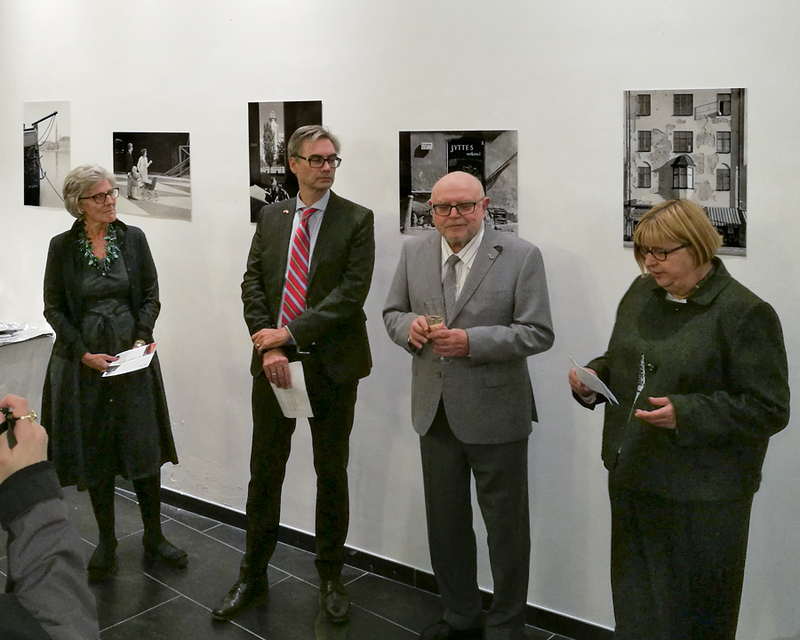 Last October, I had the pleasure of exhibiting my Stockholm pictures from the book "Stockholm/Brussels ..." at a vernissage in Vienna. I am glad to say that this met with great interest. Especially glad am I to have seen so many old friends and relatives at the gallery. The picture below shows the "grand opening" with representatives for the Swedish Embassy, the "Österreichisch-Schwedische Gesellschaft" and the gallery, all praising me with nice welcomes. Inspired by this warm welcoming, I took, in turn, care to talk at great length around the pictures on the wall. The one on top of this blog has always been my favourite, so I went into considerable detail extemporising on the provenance of the bronze horse taking centre stage therein. Afterwards, a young lady was clearly inspired by the presentation and bought the picture straight away, being the very first to acquire a fine print at the exhibition. Hopefully, I have now wetted your appetite for the story behind this horse, since I simply can't resist to let it unroll. To be precise, the horse in the picture was not originally conceived as a solitaire. 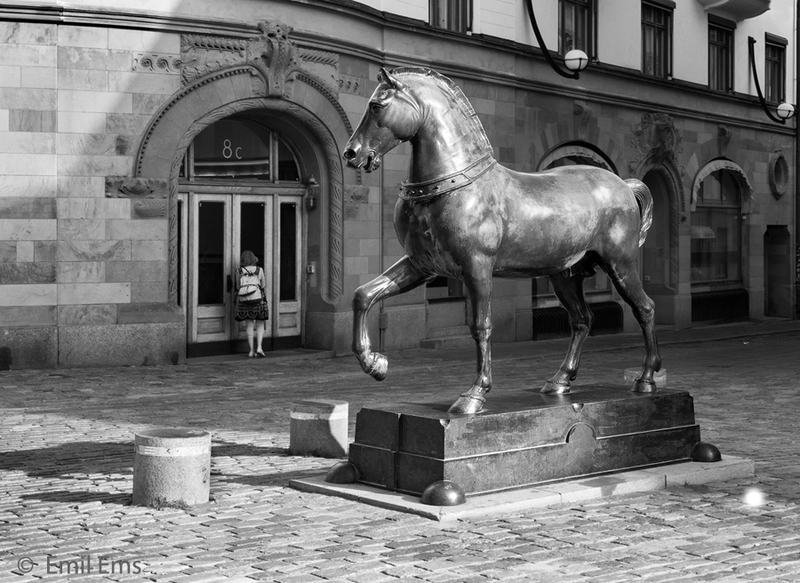 Even now, there are two such sculptures standing on Blasieholm Square, in the centre of Stockholm. But there should actually be four horses standing, since the original was cast as an antique quadriga, a four-in-hand team drawing a racing chariot. And we are not talking about just any old four-in-hand, it is the only quadriga preserved from antiquity. You don't believe me? Well, you only have to visit St Mark's Basilica in Venice to see it in all its gilded glory! But how did this quadriga wind up in Venice? You may be surprised to hear that its origin is lost in the dawn of history. Investigations of the sculpture, looking at the way the eyes had been cast and the gilding applied, led experts to the presumption that it must have been forged around the turn of the second century AD. 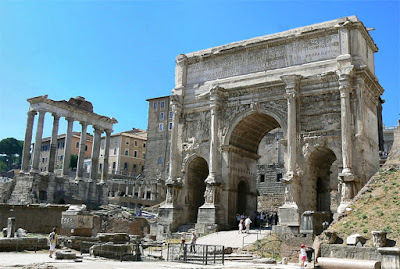 It is most plausible that it had been ordered by Emperor Septimius Severus, to embellish the top of his Triumphal Arch in Rome, in celebration of his sizeable military achievements. The gilding method, in particular, points to the emperor. It concerns a cumbersome and costly procedure, with the labourers involved being condemned to painful disease and certain death. Who but an emperor could order such work? Triumphal Arch of Septimius Severus in Rome. The Quadriga long gone! However that may be, the statue would not have remained in Rome for more than a century. 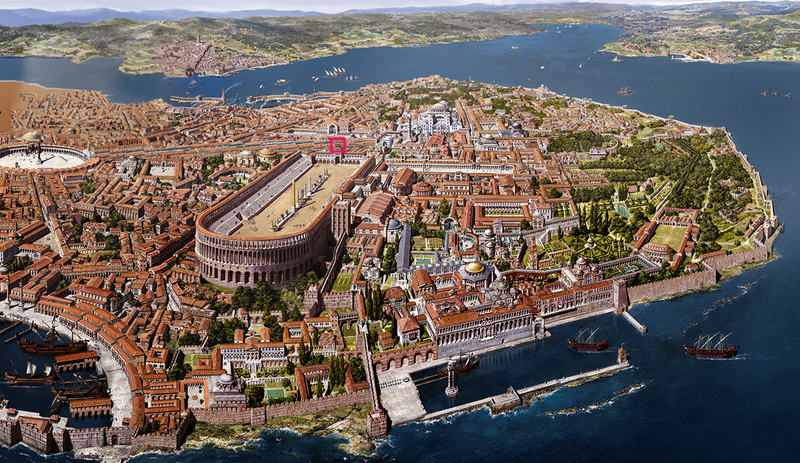 In 330 AD, a new Roman Capital was dedicated in the East, called Constantinople after its founder, Emperor Constantine the Great. Constantine put great efforts into getting this new seat of power up to imperial splendour immediately. To that effect, he pilfered sculptures, memorials, prominent obelisques, etc. from all over the Empire to adorn his "Second Rome". It is therefore plausible that such a prominent sculpture as Septimius Severus' Quadriga would not have remained unmolested on top of Severus' Triumphal Arch. The rebuilt and enlarged Hippodrome in Constantinople had a four-in-hand to show for it on top the Northern facade, with its start boxes. This most probably is Severus' Quadriga. 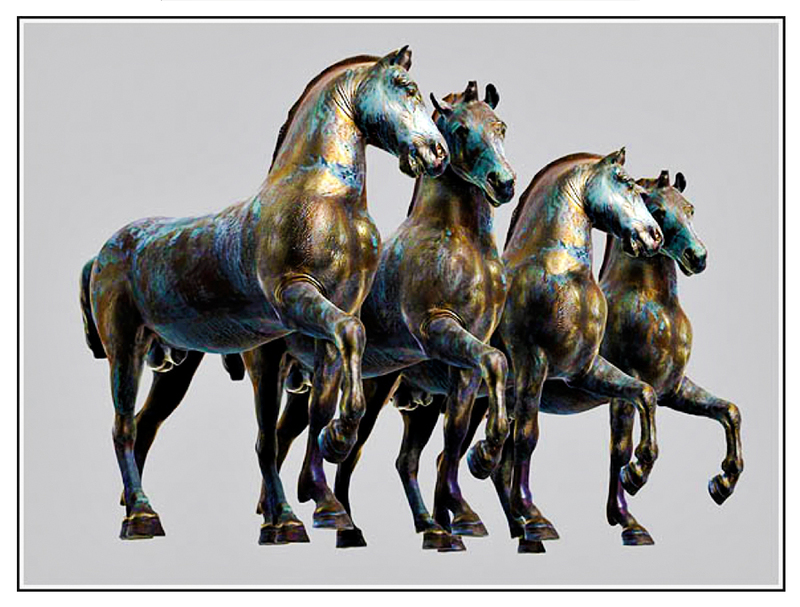 The Quadriga throned on the Hippodrome for a whole 900 years! It took a holy cruisade to remove it. To be precise, the Fourth Cruisade got "confused" and plundered, in 1204 AD, Constantinople instead of conquering Jerusalem! The Venetians, led by Doge Enrico Dandolo, participated in the plunder. 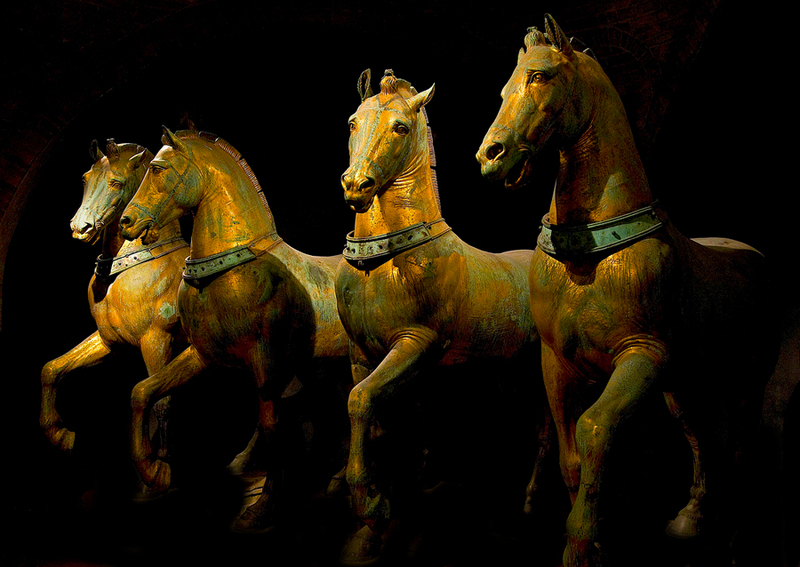 Dandolo hastened to have the horses dismounted and shipped to Venice as spoils of conquest. There they were put on the facade of Saint Mark's Basilica and are from then on known as "The Horses of Saint Mark". You may be led to believe that this is the end of the story. Far from it, several events remain to be told. Granted that another 600 years passed by without incident. But, anno 1797 AD, a modern day emperor was in the making. Napoleon had invaded Italy and now occupied Venice. Like a Septimius Severus reborn, he ordered the Quadriga to be moved to Paris, so that it eventually could crown his very own Triumphal Arch on Place Vendôme, known as the "Arc de Triomphe du Carousel". 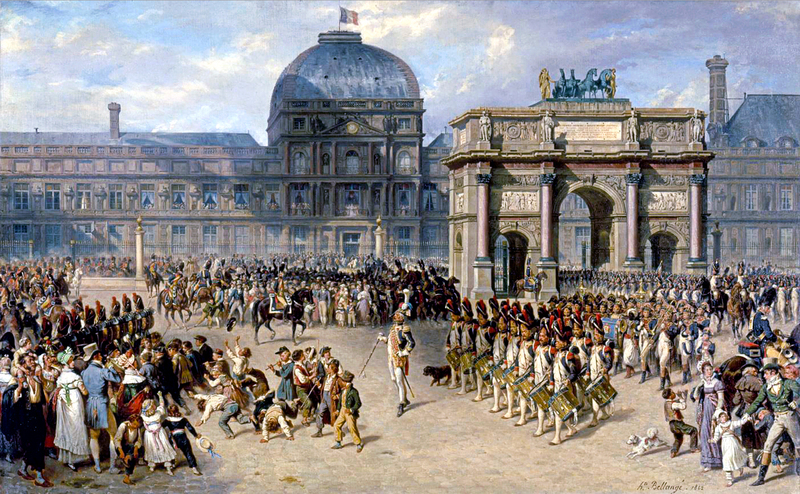 Military review in front of the Arc de Triomphe du Carousel. But, as we all know, Napoleon's power and glory came to a timely end, about 15 years after this move. Post the Congress of Vienna, Emperor Francis I of Austria, who by then had become sovereign of Venice, ordered the horses to be returned to Saint Mark. And there they have stayed, with the exception of two shorter deviations, an excursion to Rome in WWI and a visit to Padua in WWII. This about ends my New Year's Retrospection; even if somewhat longer than usual, it still contains, at the very beginning, a short glimpse at my main achievement during 2018! But what about my New Year's Resolutions? Well, I am a senior citizen by now and understand the limits of my free will. What I am able to accomplish, I will of course pursue; but no pledges from my part about activities that I am well aware to be unable to carry out. Instead, permit me to put forward some pious wishes for the future. They concern the fruit of my creative labour. By this I mean, especially, the best of my Stockholm pictures. These pictures lead a life rather more precarious than my two photographic books. The latter are safely preserved in the Swedish Royal Library, as long as that venerable institution will persist. But the fine prints I am producing will depend on the "kindness of strangers". Only if there are people gracious enough to acquire them and hang them on their wall will they have a life of their own. All I myself can do is to gift them the potential to last of up to a century, if well taken care of by their owners. So let me wish the acquirers of my fine prints, in particular of the "Venetian Horse on Blasieholmstorg", a long and fruitful life so that they can cosset this creative child of mine. Let the print bring them an understanding of the almost two thousand years of history behind it. Let it induce them to hand it over to their children and them to their children, so that it can last the life span given to it by its creator. Wir alle kennen dieses seltsame, widersprüchliche Gefühl am Neujahrsmorgen, dem selbst eine viel zu kurze Nacht nichts anhaben konnte. Wir wünschen Dir, dass dieses Gefühl der Frische im Alltag des Neuen Jahres nicht so schnell vergeht. Thanks for the good work and the detailed story behind them! Cheers, & Happy New Year! Love the story and love the art and love you,too! Hope to see you later this year. Thank you so much, Emil. Fascinating as ever. I take the opportunity to wish you all the very best for 2019. I think it promises to be an interesting year. danke für die Übermittlung und Dokumentation der Geschichte über das Viergespann in Deinem Blog. Damit wirst Du Vielen eine interessante Lesezeit ermöglichen und sie dazu inspirieren, selbst aktiv zu werden. Dazu ist Dein Ansatz, über 2.000 Jahre hinweg dem Jahresbeginn ein Zeichen zu setzen gerade richtig. Auf Basis von 2.000 Jahren werden sicher zahlreiche Geschichten zu erzählen sein. Thanks a lot for your historic view on the quadriga of St Mark in Venice! I thoroughly enjoyed reading it! 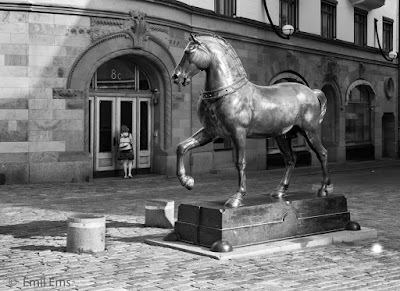 The connection with the horses in Blasieholmen are really striking! Thank you also for showing us your lovely pictures. I do hope your beautiful pictures of Stockholm will have a long life! Congratulations on having your photographic books in the Royal Swedish Library! You are indeed a master of the long view. These four hourses have travlled from Rome, to Constantinopel, to Venice, to Paris and back to Venice over a period a 2000 years. They remind us not to take anything for granted - nor to believe that the end of history has arrived! Looking forward we should expect the map to be redrawn in Eastern Europe and in the Middle East. Hopefully, Western Europe will remain for some time as you have captured it in your photographs. But you remind us that we can no longer be sure of anything. I wish you a healthy and prosperous year. We headed during Christmas period to the warm sun of Marrakech, a special place with intensive colours and impressive architecture. A destination highly recommended for an eye like yours that can catch the beauty at every corner. Wishing you a happy new year, Emil! Thank you for your insights, always perceptive, frank, and marvelous, and for your remarkable, wondrous photography. Tack för din berättelse. Önskar dig allt gott för 2019!